What can we say about Groovin' Man? If you were there, you probably don't remember, but we bet you wore something just like this. Relive those memories (or lack of them) in this oh so groovy outfit. 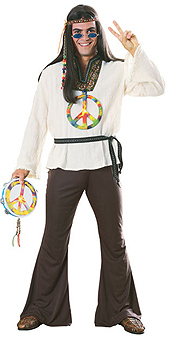 This costume includes shirt with brocade style trim, waist sash and bell bottomed trousers. Available in standard and extra large sizes.